This is it. 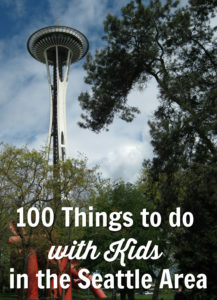 The only list of 100 things to do with kids in the Seattle-Tacoma area (and a few farther south of Tacoma that deserved mention) you’ll ever need. It’s alphabetized and designed to inspire you to get out and explore with the kiddos. Scroll forth and find that brand new thing you didn’t know was out there, or that thing you forgot about but always wanted to try, or something you tried before and want to do again. The point is – this list will help you find something to do! Go have fun! Alki Beach Park: Just across Elliott Bay from downtown Seattle, this park has a sandy beach, volleyball nets, and a nice, flat, paved walking path. Archie McPhee’s: A novelty store that’s a sure hit with kids. You’ll find all kinds of silly stuff from finger puppets to unusual action figures. 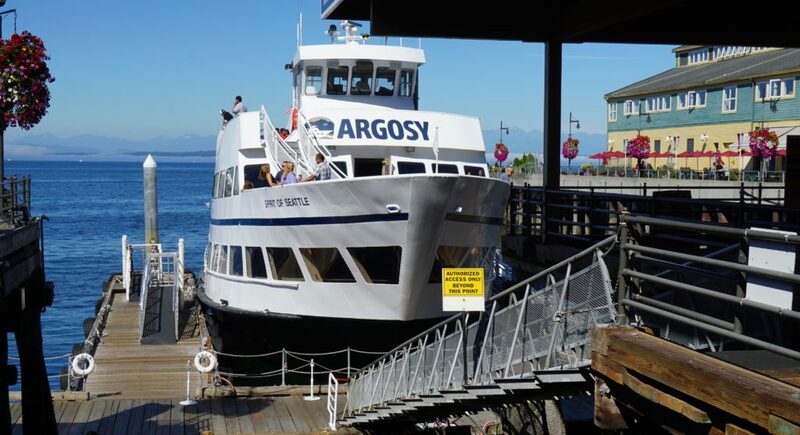 Argosy Cruises: Argosy Cruises offers a few local cruises so you can find one that suits your family best. Great choices include a trip to Tillicum Village where you can enjoy lunch and a show about the Native Americans who lived on the island, a cruise through the Ballard Locks, as well as holiday events like the Christmas Ship for a night filled with Santa, a choir, and Christmas lights. Take a cruise to Blake Island and eat a yummy salmon meal while watching a show. Artists at Play Playground: There are all kinds of playgrounds throughout Seattle, but if you have kids aged 5 or older, this one is the most unique. It’s designed by artists and includes a 30-foot climbing tower, a super tall slide, musical instruments, and more. Ballard Locks: The locks pass boat traffic between lower elevation and higher elevation, as well as the salt water Puget Sound and freshwater Lake Union, which might not sound exciting, but watching boats of all shapes and sizes load into the locks is just good fun. 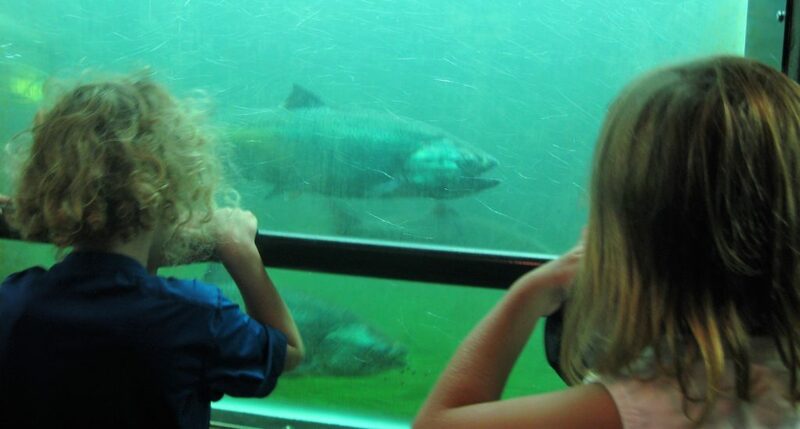 A bonus for kids – there’s also a salmon ladder where you can watch salmon swimming upstream through glass windows under the water. Berry Picking: Berries are quintessentially Northwest. Pick strawberries, blueberries, or raspberries at a local u-pick berry farm and then enjoy the berry spoils. Bellevue Botanical Garden: This 53-acre garden is lovely to explore, but also a spot for gentle hikes with kids. It’s just big enough that walking through it is fun for all, but not so big that you’ll be here for hours. Boeing Tour: By volume, Everett’s Boeing factory is the largest building in the world. It’s fricken huge. I’d leave very small children at home as the tour involves a lot of walking, but older kids – especially if they have a thing for planes – will find this pretty neat. Cross over the Ballard Locks and go downstairs to watch salmon swimming upstream. Bowling: An oldie but goodie. There are bowling alleys located throughout the area. Browns Point Lighthouse Park: This little lighthouse in Tacoma is easy to get up close to and you can take tours on Saturdays from 1-4 p.m. from May to October. Even if you don’t go inside, the little park also has some green space to run around, a shoreline, and you can explore the outside of the lighthouse. Burke Museum: Love dinosaurs? Then this is the place for you. The museum has dinosaur bones, fossils, hands-on activities about dinosaurs…and some other stuff too, but the kids are likely in it for the dinosaurs. State Capitol: Join a tour of the Washington State Capitol and teach those older kids some history! Cafés with Play Areas: Seattle has a few cafes with play areas right inside. You can kick back with some coffee, the kids can run free – Mosaic Coffee House in Wallingford, Firehouse Coffee in Ballard, Wunderkind in Northeast Seattle, and Serendipity Café in Magnolia are all awesome spots for parents with kids. Center for Wooden Boats: Take lessons, rent boats, go out on free sails…if you like boats, you can’t go wrong. Children’s Museums: Seattle Children’s Museum, Children’s Museum of Tacoma, and the Hands on Children’s Museum in Olympia are all perfect for smaller children. Dash Point State Park: This state park in Federal Way is popular for camping and hiking, but especially for its beach. Debbie Doolittle’s Indoor Petting Zoo: The name says it all. Your kids can pet and interact with all kinds of animals from wallabies to rabbits, pigs and goats, lambs, reptiles and more. Discovery Village: In Western Washington, sometimes you just need to stay indoors. Discovery Village has a fabulous indoor play area for younger children, a café to get a bite to eat, classes, and more. Eat Sweet Treats: Really, this could be a list all on its own, but if you want to go out for a treat with the tots, Seattle has tons of options. Cupcake Royale, Top Pot Doughnuts, Trophy Cupcakes, Daily Dozen Doughnuts, Molly Moon Ice Cream…the list goes on, but those are my favorites. Elliott Bay Book Company: Seattle’s premier book store’s children’s section is just plain rad. Of course, you can shop for books there, but also watch for story times, song and story times, and other kiddie events here. Farmers Markets: Seattle, Tacoma, Olympia, and just about all the cities in between have farmers markets. Hunt for fresh local produce together, listen to some live music, get your faces painted, or spend the whole time getting your kids to try something that isn’t a chicken nugget. Farms: Sometimes you just need to get out of the city and visiting a local farm is the perfect way to do that. Farrel-McWhirter Farm Park in Redmond, Kelsey Creek Farm Park in Bellevue, Fox Hollow Family Farm in Issaquah are all fine options. Ferries: Sure, ferries are useful for commuters, but they’re also great for kids. You can find ferries to walk onto at Pier 52 in Seattle that go to Bremerton and Bainbridge Island, as well as one that leaves Point Defiance in Tacoma and goes to Vashon Island. There are other ferries large and small in the region, too. Seattle Center is filled with cultural festivals throughout the year where you can try new foods, watch performances, and more. Festivals: Seattle has many festivals that are fun for families, but many of the best are at Seattle Center. Cultural festivals, Northwest Folklife, and Winterfest during the holidays are all family fun at its best. 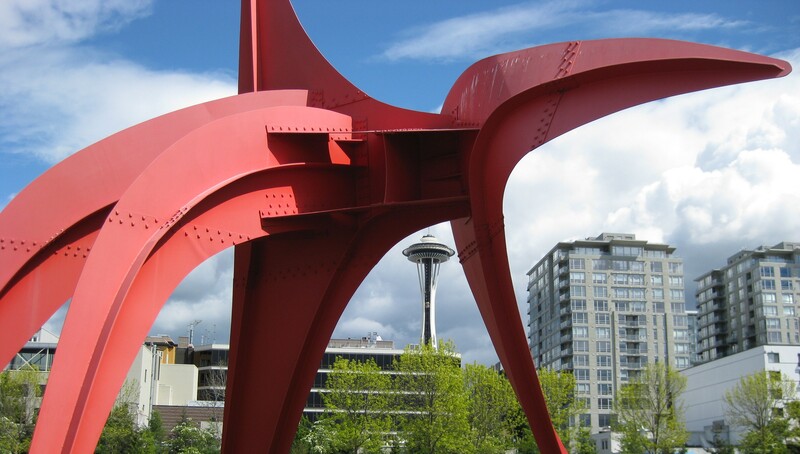 Check Seattle Center’s events page to see what’s on. Fremont Troll: Fremont is a small yet mighty neighborhood that claims to be the center of the universe, but is definitely the only place in Seattle where you can find a troll under a bridge. A big one. Kids are sure to be impressed. 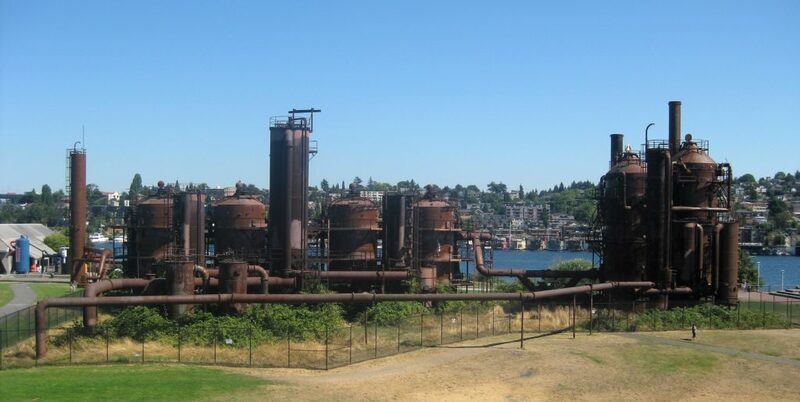 Gas Works Park: There are many parks in Seattle and they all are worthy of visiting, but some stand out. Gas Works Park stands out for its kite flying hill, its water views, and its really super cool integration of a former coal gasification plant as public space. Kids love climbing on and exploring the former industrial equipment. Giant Shoe Museum: Don’t make a special trip for it, but if you’re at Pike Place Market, take time to visit the Giant Shoe Museum, which is a wall with exhibits built right into it. Drop quarters in to peep at the giant shoes. And they really are pretty giant! Golden Gardens: A pretty park in Ballard on the Puget Sound with a short loop trail, a sandy beach, and beautiful views. Great Wheel: It’s a giant Ferris wheel! Of course the kids will love it! Not every park has a former coal gasification plant in it…which is probably a good thing, but this one is pretty neato. Green Lake Park: A 2.8-mile level, paved walking path, tons of open green space, and a lake where you can swim (providing conditions are right) are a surefire hit. Gum Wall: This wall just down and to the right from the main Pike Place Market entrance is interesting and gross…perfect for kids. Just don’t let them touch it. iFly Seattle: No, you probably don’t want your kids to jump out of an actual airplane, but as long as they’re three-years-old or older, they can “skydive” at iFly! Hike: Seattle, Tacoma, Olympia and just about all cities in the Puget Sound region have great places to hike. You don’t even have to get out of town (and often the hikes are more kid-friendly if you don’t). Visit Discovery Park in Seattle or Point Defiance Park in Tacoma for water views, gentle inclines, paved and gravel paths alike, seashore to explore, and more. Indoor Play Places: On rainy days, indoor play places are perfect. There are a number in the area like Playdate SEA, Wiggleworks with locations in Bellevue and Puyallup, Funtastic Playtorium in Bellevue, Safari inside the Southcenter Mall, Odyssey 1 in Tacoma, and Discovery Village in Gig Harbor are all options. International Fountain: Seattle Center overall is so expansive that some parts deserve special mention. On warm days, the International Fountain is an amazing place for kids who love to play in the water…it’s like the biggest, baddest sprinkler ever. Kandle Park: Kandle Park is home to Tacoma’s only wave pool as well as a sprayground, a kid pool, a playground, and lots of green space. Kids Discovery Museum: This Bainbridge Island museum is filled to the brim with places for kids to explore, exhibits, special events, and fun. Klondike Gold Rush: This unusual national park has exhibits and films about the gold rush, but what you’re really here for if you have kids is to join in the gold panning demonstrations at 10 a.m. and 3 p.m. every day between Memorial Day and Labor Day. Bonus, your kids can earn their Junior Ranger badges here too. Lake Sammamish State Park: Two beaches, a playground, trails, picnic tables…what more could you want? Laser Tag at Laser Quest Federal Way: Play some laser tag! 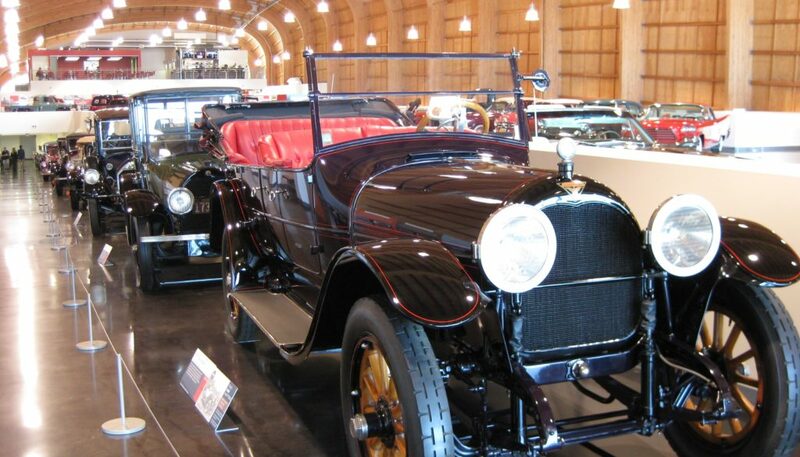 Little motorheads will love LeMay – America’s Car Museum. LeMay – America’s Car Museum: Little motorheads will love the hundreds of cars on display, and the Family Zone makes car history fun for all. Don’t miss a family photo in the 1923 Buick. Library Story Times: Whether you have a library card or not, you can take your kids to library story times. This is best for smaller children and toddlers. Light Rail: The light rail is more utilitarian than fun attraction, but ride at a non-peak time and your kids will enjoy the train ride through town. McMenamin’s North Shore Lagoon Pool: This pool is uniquely located within a McMenamin’s. It’s an indoor pool, but with windows open to the outside (so if it’s cold out, then the air will have a chill to it even though the pool is heated). The property also has a hotel, restaurant, poolside drinks, and more, but if you have kids, you’re likely here for the pool. Even if you don’t stay at the hotel, the pool is open to the public with an admission fee. Mini Golf: There are mini golf courses throughout the Seattle area, indoor and out. MOHAI (Museum of History and Industry): Probably best for older kids who can appreciate looking into a periscope or exploring the history of the Northwest. There are plenty of hands-on activities. Monorail: It’s classic. It’s fun. It will also whisk tiny feet between downtown’s Westlake Center and Seattle Center without having to walk the distance. MoPOP: Formerly the Experience Music Project and the EMP Museum, MoPOP can be a lot of fun for kids. Exhibits are focused on pop culture, which is always a hit. Exhibits have focused on things like the Muppets and Marvel Comics. The Sound Lab allows anyone to experience making music themselves. Mt. Rainier: There are plenty of kid-friendly hikes in Mt. Rainier National Park, or head straight to Paradise and wander among the wild flowers (in the spring and summer). Mt. Rainier Gondola: This gondola climbs about 2,000 feet to the top of Crystal Mountain. The views are thrilling and beautiful, and there’s a restaurant and trails at the top. Museum of Flight: Planes, planes, and more planes. Aside from checking out the planes, look for family events on the calendar where you might make gliders, or rockets, or learn about the Wright Brothers. Museum of Glass: Most of this museum might be a little dry (and breakable) for most kids, but older kids might enjoy watching glass blown live in the hot shop. There are also hands-on kids activities and crafts. Nisqually Wildlife Refuge: Explore and look for wildlife in this unique wildlife habitat. There’s a wooden walkway that lets you walk out over the estuary as well as trails. Northwest Trek: A unique complement to the local zoos, Northwest Trek puts you on a tram that ventures through an open park where you can see animals in their natural environment. Old MacDebbie’s Farm: More of a more intimate zoo than a farm, Old MacDebbie’s Farm in Spanaway let’s kids interact with animals like tortoises, rabbits, camels, and others – some of which live without cages or enclosures. Olympic Sculpture Park: If you’re looking for a unique outdoor space, the Olympic Sculpture Park is just what it sounds like…a park with sculptures large and small that are sure to make for some Instagrammable photo ops. The Pacific Science Center is geared toward kids of all ages. 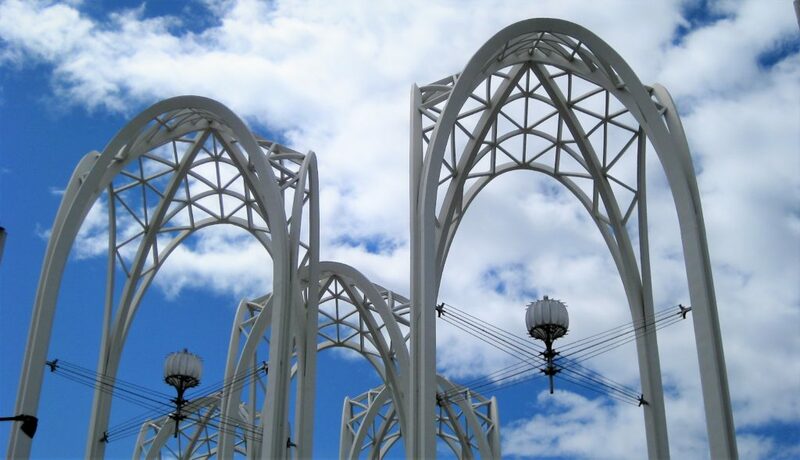 Pacific Science Center: It’s tough to beat this science museum for its fun exhibits, butterfly room, IMAX theater and quirky attractions like the gravity bike at its entrance. Painted Pottery: For creative kids, an afternoon out painting some pottery might just do the trick. Spots like Paint the Town in University Village are perfect. Pierce College Science Dome: Enjoy an almost-OMNIMax experience for a fraction of the cost and a much more intimate atmosphere…and the kids will learn a thing or two, too. Point Defiance Zoo and Aquarium: Now with a newer, larger aquarium that has sea turtles and hammerhead sharks, this zoo has a mix of Northwest animals as well as animals from around the world, including several tigers. Point Ruston: Tacoma’s Point Ruston has a bit of everything – a state-of-the-art movie theater, restaurants and cafes, a playground, a fountain where kids can play, and wheeled non-motorized vehicle rentals. Public Pools: In the summer, going to a public pool is the perfect way to stay cool. Rent a Boat: Seattle is surrounded by water so why not get out onto it! You can rent kayaks on Lake Union if you have kids ages 16 and older, or rent kayaks, canoes or rowboats from the Waterfront Activities Center at UW if your kids are 25 lbs or heavier and can walk on their own, or rent kayaks to the south at Owen Beach in Tacoma or on the Gig Harbor waterfront. Always check ahead to make sure your child is allowed to go as age restrictions can change. Rollerskating: It’s a little bit vintage, but there’s nothing wrong with that. Go skating or rollerblading at a few spots around Seattle, or at Rollin 253 in Tacoma. Saltwater State Park: Located between Seattle and Tacoma, this state park has a sandy beach, tidepools galore, trails and picnic areas. Seasonal Fun: If it’s October, lots of area farms transform into pumpkin patches and/or corn mazes, and bring out all kinds of other activities from pumpkin cannons to hayrides. If it’s December, look for Christmas lights displays at Woodland Park Zoo, Point Defiance Zoo and Aquarium, Spanaway Lake Park, and Bellevue Botanical Garden. Likewise goes for Easter egg hunts, July 4th family fun, and other holiday happenings. Touch a starfish at the Seattle Aquarium. Seattle Aquarium: Get up close and personal with jellyfish, otters, and aquatic critters of all sorts. Seattle Art Museum: Skip wandering the galleries and hoping your kids don’t break something, but do check out the family programs and events as they include a bit of everything. Seattle Central Library: This huge and unique library is filled with colorful escalators, hallways, and books galore. You can also get some pretty sweet views of downtown from the top floor. Seattle Children’s Theater: Get those kids some culture! And a fun show to boot! Seattle Gymnastics Academy: Don’t let the name fool you – taking gymnastic classes are just one aspect of this place. You can also take your kids ages 0-5 here to play on age-appropriate gymnastics equipment. Seattle Pinball Museum: Call it a museum, but it functions more as a pinball arcade filled to the brim with vintage machines. Teach the kiddos a little something about the ‘80s. Seattle Underground: Younger kids might not love the Underground, but older kids and teens will likely get a kick out of this subterranean version of a former Seattle. Space Needle: If you have toddlers, I’d skip this…unless your toddlers tolerate lines well. Kids and teenagers will likely enjoy going up the Space Needle, though. Sports: Go to a baseball game at Safeco Field in Seattle or Cheney Stadium in Tacoma, a football game at CenturyLink Field, or a Sounders soccer game also at CenturyLink. Spraygrounds: In the summer, spraygrounds are a great alternative to pools. They can be found at all kinds of parks in Seattle, Bellevue and Tacoma. Stewart Heights Park: Like Kandle Park, Stewart Heights has an amazing outdoor pool, but this one has a waterslide and zero-depth entry, as well as a skatepark and a playground. Sunday Ice Cream Cruise: Hop aboard a small ferry on Lake Union and take a tour of the lake while eating ice cream. Nothin’ wrong with that. Swimming: Seattle has plenty of pools, but if you want to take a dip in the Puget Sound or a local lake, you can do that too. Mathews Beach, Madison Park, Green Lake, Golden Gardens and Lake Sammamish all have swimming beaches. Tacoma Musical Playhouse: This all-musical theater in Tacoma has a family theater season each year that brings on fun shows for kids with shorter running times. Tacoma Nature Center: Explore nature exhibits, play on the playground, or hike the path through the forest and look for turtles in the water along the way. Take a Tour: If you have a kid who loves to learn, Seattle loves to teach. Tour Pike Place Market, go on a ghost tour, head down under on the Seattle Underground Tour, Ride the Ducks, or even tour a historic theater. Tenino Quarry Pool: This is hands-down the most unique swimming pool probably in the state. A former sandstone quarry is now filled with water and used as a pool. There’s a lifeguard on duty. The pool is open generally in July and August each year. 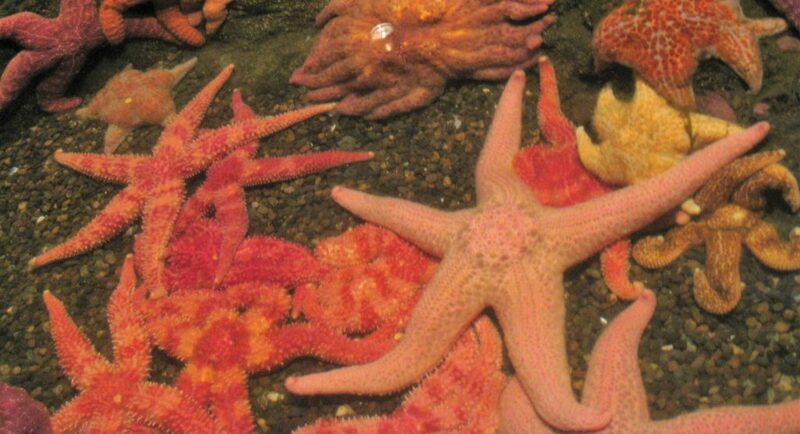 Tidepooling: Explore some shore and tidepools at Constellation Park, Discovery Park, Golden Gardens, and Carkeek Park. Tot Lot in Fircrest: This little playground in Fircrest is designed for young children and even has toys scattered around for little ones to play with, including walkers for younger tots. Toddlers will especially love it. Trampoline Parks: Got kids bouncing off the walls? Why not let them actually bounce off the walls? There are a few trampoline parks in and around Seattle: Elevated Sportz in Bothell, Sky Zone (coming soon to Tacoma at the time of this writing), Aerosports in Federal Way, and Flying Circus in Tukwila. Tukwila Family Fun Center: Games, bumper cars, bowling, laser tag, go karts, mini golf, batting cages and more…this place has it all. University of Washington’s Jacobsen Observatory: Have a little astrophysicist on your hands? Enjoy talks and tours of the observatory as well as free peeps into the night sky. This is best for older kids who can stay up past 9 p.m.
USS Turner Joy: Located in Bremerton, the USS Turner Joy is a Navy Destroyer that you can actually go onto and explore just about every inch of it. Leave the toddlers at home as there are ladders and sets of stairs galore. Vashon Llamas: Get up close and personal with llamas or observe from a distance. If you want to, you can walk, feed or otherwise interact with the llamas after a safety intro. View Points: The Space Needle is far from the only view point in town. The Columbia Tower and Smith Tower both have observation decks for a fee. The Seattle Central Library and Volunteer Park water tower also both offer lofty perches for free! Volunteer Park: This huge park has all kinds of things to do within its bounds – a conservatory, a playground, the Seattle Asian Art Museum, a wading pool, and lots of open space. 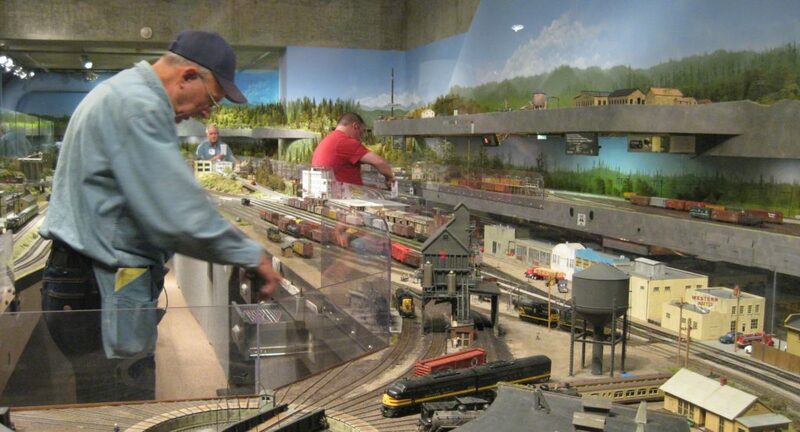 The Washington State History Museum’s model train spans 1,800 square feet! Washington State History Museum: Aside from the museum being more kid-friendly overall than your average museum, WSHM also has a model railroad that tops out at 1,800 square feet…that’s a whole lot of model train! Waterfront in Tacoma: Tacoma’s Ruston Way Waterfront is perfect for a stroll and has parks, beaches, and restaurants dotting the way. Water Taxi: The Seattle Water Taxi is like a ferry, but smaller and with no drive-on traffic and it goes exclusively between Pier 52 in Seattle and West Seattle, which is fun to explore. Wild Waves: Wild Waves is perfect for younger children as many of the rides are smaller. The water park is a hit during warmer months. Wings over Washington: This neato ride on Pier 57 in Seattle gives you an eagle’s eye view of all the things that make Washington amazing. It’s thrilling and a lot of fun! Kids must be at least 40 inches to ride. Wolf Haven: If your kids are interested in wolves, learning more about them, or seeing them in more or less their natural habitat, this is a great place. Reservations are needed and this is not like visiting a zoo (no snacks, and no free wandering – you’ll be on a guided tour). Woodland Park Zoo: Zebras, primates, giraffes, and all your favorite zoo animals live here. What’s not to love? Ye Olde Curiosity Shop: First, make sure your kids aren’t easily creeped out, but if they enjoy a little bit of weirdness, this shop is sure to ignite their imaginations with its oddities and kitsch. There are two real mummies, animal skulls, and replica shrunken heads, but also vintage toys, Bigfoot merchandise, and more.